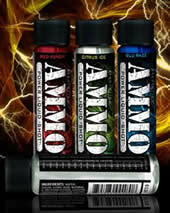 Ammo is an energy shot that comes in four flavors: Fruit Punch, Citrus, and Blue Raspberry, and purple dragon. The drink should be diluted into 16 ounces of liquid. As for downing the bottle in one hit, the manufacturers claim the "do not support or recommend it" although it is safe to drink. 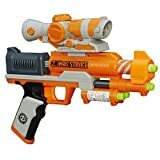 The four flavors of Ammo have been tweaked for re-release in 2010 as "functional shots" with the addition of a sugar-free version. Sugar content: 7 grams (per 1 ounces). 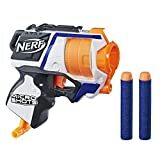 How Does Ammo Energy Shot Compare? Ammo Energy Shot contains 171.00 mgs of caffeine per fluid ounce (578.22mg/100 ml).